In 2013, DC Energy submitted several proposals to the City of Burlington as part of an RFP to promote solar on city owned rooftops. We were awarded two projects. The one on BED’s warehouse building began construction in July 2015. This is the largest rooftop system actually in the City of Burlington. 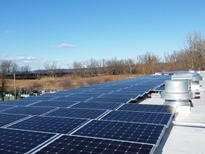 This system provides renewable electricity for Burlington’s municipal utility at a secure long term rate. It also helps keep ratepayers’ rates low and fulfill the intention of BED to be 100% renewable. Click here to read about this project on the BED website.